Cloth Diaper Revival: How I taught my toddler to sleep in! 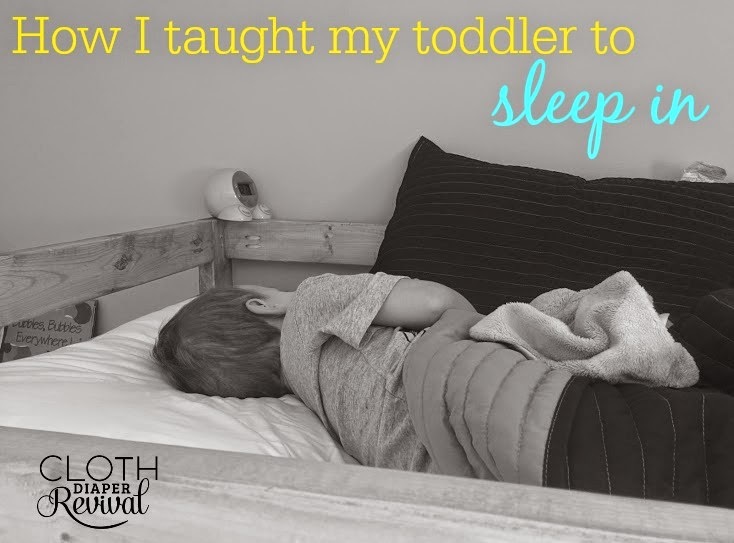 How I taught my toddler to sleep in! I've been blessed with an excellent sleeper for the most part. He started sleeping 12+ hours a night with no nighttime feedings around 7 months old. With the exception of a few rough nights here and there, the last three years have been great! He's an excellent napper and has always willingly gone to bed on time and without a big charade of events. But last spring something changed. He started waking up at 6 am. My poor body couldn't take it! I was exhausted. I was evil. I started making comments in the morning like "I hate my life." Now obviously I didn't mean it, but I just couldn't function. My son didn't want to snuggle at 6 am. He didn't even want to watch TV. This kid was ready to go! He would come running into my room, pull the covers back and start dragging me out of bed. My response was not pleasant. My poor child and my dear husband had to suffer the wrath of a tired and angry mommy! It was just too early for me. I was having a hard time functioning. I'm not the type to jump out of bed ready to go in the morning. I need to take things slowly. So I started looking for solutions. After some searching on Amazon, I settled for the Onaroo OK to Wake Children's Alarm Clock and Nightlight . I asked about it on my Facebook page and got some mixed reviews, but I was desperate. It was worth a shot! When the clock arrived, I set the "green light" timer for 7 am. Just one more hour. That's all I was asking for! We talked to our son about how "you have to wait for the green light!" and kissed him goodnight. The first week wasn't amazing. He still woke up early, but I would send him back to bed to wait. After about a week he finally got it! We've been using the "green light" for a couple months now and it is a life saver! Everyone is much happier! My son is getting more sleep and, more importantly, I'm getting more sleep! Our mornings are much more pleasant! And everyone knows, "if mama ain't happy, nobody's happy!" Now when he comes running into my room at 7 am shouting "the green light, the green light", I look at my clock and get out of bed. No complaints (most of the time). The Onaroo clock also has a alarm buzzer that will be useful when he's older, but for now we're just using the light feature. I also love that the light doesn't wake him up. If he wakes up and sees the light he knows it's okay to wake up, but if he's having a sleepy morning and wants to sleep in, the light doesn't interfere with that. So, if you're struggling. And I mean really struggling. Like you can't function and your marriage is in shreds every morning because you are a beast without sleep, consider this clock. For real. It helped me to be a better parent. Not a sponsored post. This does contain affiliate links. We used the Sleep Buddy same concept but with a blue light, a little story book to explain the concept, and a reward chart. The light comes on for bed/nap time and turns off when its ok to get out of bed. It worked so well that when we travel and forget it we've had to put blue tissue paper over a flashlight and tell him that blue light is on - then we would turn it off when we got up. I think they are great tools to help adjust sleep times.